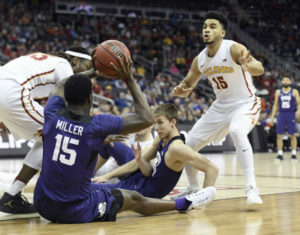 Playing their third game in three nights, TCU’s fairy tale run in the Big 12 Tournament ended with a thud Friday night after a 21-point loss in the Big 12 semifinals against No. 23 Iowa State, 84-63. The game began to turn in favor of the Cyclones with 13:54 left in the first half when Iowa State went on a 10-0 run to put themselves in front of the Horned Frogs 16-10. The Cyclones had another big run to conclude the first half, finishing the first 20 minutes with a 21-9 run in the last 8:30 of action. Iowa State bested TCU in overall field goal percentage, 56 percent to 39 percent, and in three-point field goal percentage, 46 percent to 26 percent. Iowa State guard Deonte Burton led all players in scoring with 22 points, while Vladimir Brodziansky and Jaylen Fisher led the Horned Frogs in scoring with 10 points each.